THE HAGUE -- The United Nations' top court on Wednesday ordered the United States to lift sanctions on "humanitarian" goods to Iran that President Donald Trump re-imposed after pulling out of the 2015 Iran nuclear deal. The International Court of Justice (ICJ) unanimously ruled that Washington "shall remove by means of its choosing any impediments arising from the measures announced on May 8 to the free exportation to Iran of medicines and medical devices, food and agricultural commodities" as well as airplane parts, said judge Abdulqawi Ahmed Yusuf. The court said sanctions on goods "required for humanitarian needs... may have a serious detrimental impact on the health and lives of individuals on the territory of Iran." U.S. sanctions on aircraft spare parts also had the "potential to endanger civil aviation safety in Iran and the lives of its users". Mr. Trump slapped a first round of sanctions on Iran in August after pulling out of the historic deal aimed at curbing Tehran's nuclear ambitions in May, to the dismay of his European allies. A second round of punitive measures is due in November. The ICJ rules on disputes between United Nations member states. Its decisions are binding and cannot be appealed, but it has no mechanism to enforce them. Tehran dragged Washington to the ICJ in July, seeking an emergency suspension of the economic sanctions on the grounds that they breached a 1955 "friendship treaty" with the U.S. that predates Iran's Islamic Revolution. Iranian Foreign Minister Mohammad Javad Zarif has called the sanctions a form of "psychological warfare" aimed at regime change. "The economic warfare that the United States and some of its regional clients are conducting against Iran is psychological warfare more than real economic warfare," he told BBC radio. During four days of hearings in late August, Iran's lawyers accused Washington of "strangling" its economy. Washington, however, forcefully told the court that it has no jurisdiction to rule on this case as it concerns a matter of U.S. national security. CBS News' Pamela Falk at the U.N. says the U.S. is likely to challenge the provisional decision with an appeal. Secretary of State Mike Pompeo has called Iran's case at the ICJ "meritless." The Court's decision was an interim ruling, and the decision left open the possibility of a challenge, Falk reports. The ruling stated: "The decision given in the present proceedings in no way prejudges the question of the jurisdiction of the Court to deal with the merits of the case….. It leaves unaffected the right of the Governments of the Islamic Republic of Iran and the United States of America to submit arguments" on the merits or admissibility of the case." Wednesday's ruling is in fact a decision on so-called provisional measures ahead of a final decision on the matter, which may take several more years, experts said. Richard Nephew, a former lead U.S. sanctions expert during Iran deal negotiations, said the case was likely to have more of a symbolic than actual impact. Pompeo: Rouhani's comparison of Trump to Nazis is "outrageous"
"The Iranian foreign ministry knows it needs to play to its audience, which is the international community, portray itself as the aggrieved party," Nephew told the BBC. He said he was "not convinced" that Mr. Trump would obey any ruling from an institution that he "doesn't respect at all" but said that "in terms of playing to the international court of public opinion, it's a pretty important step." Mr. Trump's America First policy largely rejects overarching international organisations, and he recently heavily criticized the separate International Criminal Court in The Hague over a probe into alleged U.S. abuses in Afghanistan. The 2015 nuclear deal saw Iran agree to limit its nuclear program and let in international inspectors in return for an end to years of sanctions by the West. But Mr. Trump pulled out of the deal in May, arguing that funds from the lifting of sanctions under the pact had been used to support terrorism and build nuclear-capable missiles. European allies have pledged to keep the deal alive, with plans for a mechanism to let firms skirt the U.S. sanctions as they do business with Iran. U.S.-Iran relations have plunged to a new low since Mr. Trump's election in 2016, even as the U.S. president reaches out to North Korean leader Kim Jong Un over his nuclear program. Mr. Trump and Iranian President Hassan Rouhani faced off at the U.N. in September, with Rouhani denouncing leaders with "xenophobic tendencies resembling a Nazi disposition." Despite their 1955 Treaty of Amity and Economic Relations, Iran and the United States have not had diplomatic ties since 1980. The case is the second brought by Tehran against Washington since 2016. 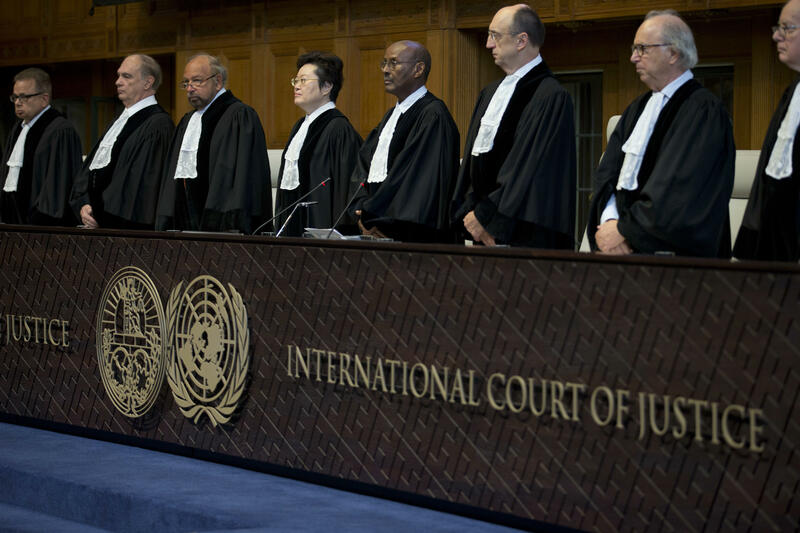 That year it brought a suit at the ICJ against the freezing of around $2 billion of Iranian assets abroad which U.S. courts say should go to American victims of terror attacks. Hearings in that case are due to start next week. © 2018 CBS Interactive Inc. All Rights Reserved. This material may not be published, broadcast, rewritten, or redistributed. Agence France-Presse contributed to this report.